Kristin asked about parking in La Linea before she crossed the border on foot into Gibraltar. I told Kristin she is absolutely right in her planning. There is no need to take a car on a day’s excursion into Gibraltar. It’s much simpler to take a taxi or bus from the border . Crossing the frontier out of Spain from La Linea on foot is half the fun of visiting Gibraltar. If you are lucky, a plane might just be landing or taking off. The line of cars and walkers always wait good naturedly in the sun and it seems to take ages before the plane’s engines are run up before take off. As soon as the plane is in the air, or taxied back to Gibraltar airport, the barriers on both sides lift and the visitors surge forward across the runway. 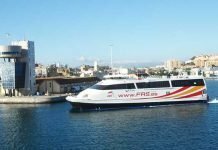 You might even consider taking a bus to La Linea using the Gomarbella online bus booking engine. There are lots and lots of pay and display parking places along this avenue, be generous with your time allocation. If not you might have to suddenly cut short your visit whilst in Gibraltar. If you’d like to come back to a cooler car in the summer, make for the two entrances to the Focona underground parking garage in La Linea. We always use the entrance seen in the picture above which is right next to the big roundabout half way along on the Gibraltar side of Avenida del Ejército. If you are using a GPS, just set it on Avenida del Ejército. The Focona Parking Garage in La Linea could not give me a street number for this entrance, but you’ll easily pick up the blue signs for the public parking garage. The roundabout is big enough for you to do a couple of rounds whilst you pick out the entrance. At the same point there are actually two separate entrances to two different garages. The bigger one is Parking Focona to the right, on the left is the entrance to Parking Constitución. Parking Focona also has another entrance, Avenida 20 de Abril, 11300, La Linea de la Concepción. A hint, if you are doing an online bus ticket booking or setting the address in your GPS, you may need to put in Concepción de la Linea. Who said life is straightforward? This second entrance is easiest found using your GPS. It will come up on Google Maps though. It’s an enormous garage with lots of space, it does fill up during the summer. There is an automatic payment machine or if you don’t have change, a ticket office just inside. Leave all your belongings in the car boot out of sight. I always give this advice no matter where you park your car in Spain. The Focona garage is also where Gomarbella hire cars are picked up and returned in La Linea. The car hire offices are just outside the parking garage in La Linea on the pedestrian approach to the border. 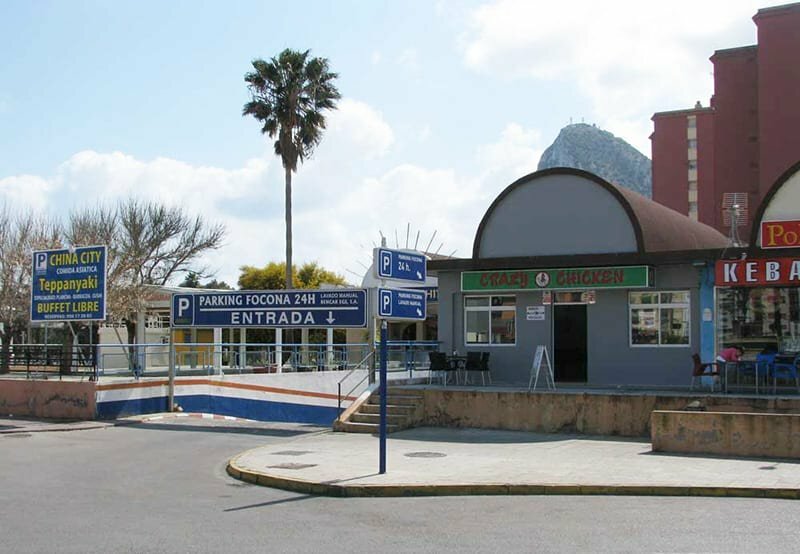 When picking up a car, after flying into Gibraltar, cross the border, do the formalities in the car hire office and then drop into the Focona underground parking garage to pick up your hire car. I am looking for park space in La Linea (not underground, just normal outdoor space, without roof etc)- can you recommend sth? And how much does it cost? Hi Doris, thank you for writing in. 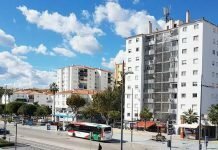 From Benahavis you will have to come down to the bus station in the San Pedro de Alcantará boulevard and take the bus from there to La Linea de la Concepción which is on the border with Gibraltar. There aren't many buses at all from Benahavis to San Pedro so it might be easier to take a a taxi. Hi Mike, just wanted to say thank you very much for the info you posted here, made it super easy for us to find the parking and enjoy our day in Gib, gratitude vibes! Hi there, the site to look at for timetables is renfe.es It is clunky and not worthy of the national railway system which works very well. You can change the language to English on the home page. You won't be able to book online! Get the tickets from the station instead just before boarding. The trains you need leave Algeciras, travel through San Roque and then pass through Los Barrios before swinging inland to Cadiz or other destinations. Use one of those towns as your point of departure. Algeciras, San Roque and Los Barrios are all a short taxi ride from the border of Gibraltar. The Spanish taxis park just outside the border control. It won't cost much at all to get to one of these train station. San Roque is closest. Hi, I'm looking for train information from La Linea (we're flying into GIB) to Cadiz City, your artciles have been really helpful, but am struggling to find is this is possible and timetables!